Inspecting a vetch cover crop in rice paddy. In the early 1990s, agricultural production in North Korea began a precipitous decline that ultimately resulted in a famine from which perhaps 5 percent of the population died. Since the worst years of 1996 and 1997, food production has recovered somewhat, and international aid has helped avert the worst consequences. Yet farm production in the DPRK still remains far below its potential, despite substantial and continuing efforts by farmers, the government, and international aid organizations. This need not continue. With the right combination of technical and institutional changes, the North could end the continuing food shortages and still maintain a self-reliant economy. Government and farmers are beginning to address many of the technical problems, but institutional factors impede the ability of farms and the will of farmers to invest in the production process. If these factors can be resolved, the farm sector could become dynamic and productive. Modern farming in North Korea began with land reform and collectivization in the 1950s. In the 1960s, Green Revolution farming techniques were introduced: rice and corn varieties that responded well to fertilizer were developed; use of chemical fertilizers was greatly increased; many farm tasks were mechanized; and irrigation systems were built to supply most rice paddies. This so-called “Rural Technical Revolution” succeeded in increasing production, especially of cereal grains, but also planted the seeds of the 1990s food crisis. The centrally planned economy isolated farm-level decision making from normal economic signals, and encouraged production methods which were costly and inefficient. High yields were achieved, but only through a significant subsidy obtained by concessional trade for fuel and fertilizer with the Soviet Union and China. A national system of technical advice and planning succeeded in disseminating modern farming methods, seeds and equipment throughout the North, but at the same time encouraged a uniformity of technique that did not always take into account local or temporal variations in environment or weather. Regular application of large amounts of fertilizer, combined with the lack of crop rotation or incorporation of crop residue into the soil, greatly degraded the soil’s fertility. With the dissolution of the Soviet Union and a new Chinese economic policy requiring full payment for fuel and fertilizer purchases, the DPRK could no longer acquire the energy and other inputs needed to maintain productivity in agriculture or industry. The whole economy began to contract, most clearly evidenced by the sharp decline of food production. Two years of floods followed by a year of widespread drought further compounded the problem. Grain production in 1996 and 1997 fell to about 42 percent of its 1989 peak. The initial response by government and the people was to work harder and longer with the resources at hand. Urban residents were mobilized to work on farms during the planting and harvest seasons, and marginal lands were brought into production. But this approach could only accomplish so much. As in South and Southeast Asia, farmers found that yields of so-called high-yielding varieties of rice and corn fell drastically when deprived of fertilizer. Lacking fuel or repair parts for tractors and rice planters, farmers struggled to complete tasks on time. With international assistance, double cropping (of winter wheat or barley or of spring potatoes) was re-introduced in an effort to wring more food from a limited land resource. Steep hillsides were cleared of trees and brush to use as heating and cooking fuel, and to make way for the planting of emergency crops of corn. Lacking adequate fertilizer, yields were low and erosion severe, but a few more baskets of grain were harvested. In this food emergency, short-term results were crucial. The initial response of the Korean people and international donors was appropriate: fully exploit all available resources, even at the cost of later degradation; provide food aid to address the acute need; and provide fertilizer to support immediate increases in farm production. Donors could have sent even more fertilizer, but most preferred to supply food because of an aversion to “propping up the economy of a totalitarian state.” Purchase of fertilizer would have yielded eight times as much food as the equivalent direct expenditure of food, and helped to revive the cooperative farms. But North Korea’s questionable status among Western governments has led to a politically motivated and specious distinction between “humanitarian” assistance (i.e. 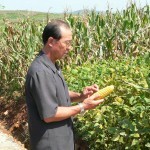 food) and “development” assistance that might rebuild the DPRK economy. Many factors limit farm production in the North. Decades of over-fertilization have rendered the soil acidic and with low organic matter. Rainfall is scarce and uneven in the early spring, and the growing season is short. Farm equipment is severely degraded and unable to perform needed tasks in a timely way. But these problems can be addressed, and aid programs, as well as North Korea’s agricultural research establishment, have already started developing responses. Early efforts focused on changes that could quickly increase production, and over time began to address more fundamental issues. In addition to double cropping support, many donors assisted potato production as a crop better suited to the higher and colder regions of North Korea than corn. Ultimately a nation-wide system for potato seed production was established, with high quality, virus-free seed potatoes supplied to many regions. Inspecting a trial soybean crop prior to harvest. By 2002, most agencies providing agricultural assistance were recommending technical changes that would introduce modern sustainable farming practices to North Korean farms. These included crop diversification and crop rotation that would begin to improve soil quality, integrated pest management, and limited tillage farming. Some groups such as American Friends Service Committee (AFSC) and the Swiss Agency for Development and Cooperation (SDC) began experiments to plant green manures—cover crops that can extract nitrogen from the air for use by a following grain crop. Government production quotas initially limited the ability of farm mangers to modify the crop mix on their farms. Responding to field experiments in 2002 and 2003 where the AFSC encouraged rotating soybean with corn, several farm managers told me that they could actually see that soybeans improved soil quality and aided corn production. They also knew soybean prices were about 50 percent higher than corn (both state and market prices), and calculated that the profit from a hectare of soybean was the same as from a hectare of corn. But only the total volume of grain production was counted toward their government quota and they could therefore not afford to trade 1.5 tons of soybeans against 4 tons of corn. Corn planted in rotation with soybean produces a good crop. 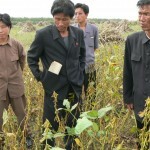 However, responding to continual suggestions from many aid organizations, as well as to projects by the Food and Agriculture Organization (FAO) and the International Fund for Agricultural Development (IFAD), the North Korean agriculture ministry began to support crop diversification and rotation. 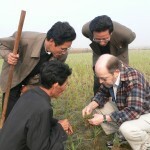 By 2005, fields planted with soybean could be seen at many farms, and the agriculture ministry began to distribute new varieties to the farms for production. In 2007, soybean production had increased to 132,000 tons, accounting for around 8 percent of the area in annual crops. This is a significant change in a short time. The area planted to legumes and potatoes has also gradually grown, though rice and corn still dominate. 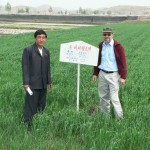 Supplemental irrigation of rice paddies is essential for timely seedling growth and transplanting. By the 1990s pumps were in disrepair and not regularly supplied with power. The Organization of Petroleum Exporting Countries (OPEC) supported the Kaechon-Taesong Lake irrigation canal, completed in 2002. This 150km canal replaced most of the pumps and brings irrigation water to over 100,000 hectares of paddy fields north and northwest of Pyongyang. Farms where I was working immediately took advantage of the increased water reliability. Two other similar canals have since been completed, one in North Pyong’an province and one in North Hwanghae province. These canals free substantial electric power for other uses, and greatly increase the reliability of rice irrigation. During the last five years both international donors and the North Korean government have emphasized sustainable farming practices. In at least some quarters in the North, the cost and difficulty of importing fertilizer is recognized, and local programs to produce compost and organic fertilizer (called hukposan) are being emphasized. For example, AFSC supported the construction of a rapid composting plant at a research farm, where the staff use beneficial soil bacteria and a small amount of chemical fertilizer to augment standard composting methods. None of the changes discussed above were implemented without difficulty or controversy, and neither are they uniformly practiced. However, other important issues regarding the ownership and management of marginal and sloping lands, and the role of livestock in the farm enterprise remain unresolved. Nonetheless, a good start has been made. Rice field planted to green manure cover crop. With these many changes, one might expect a gradual increase in DPRK farm production. Instead, food production has been erratic, rising to about 4.5 million tons in 2005 but declining again since then. Production has varied between 800,000 and a million tons below the bare minimum requirement for the last several years. While the DPRK may eventually decide to import food with profits from industry, I have shown elsewhere that even with its limited farmland the country could sustainably produce enough food to feed its population. [i] Key interventions would include widespread use of green manure crops to raise grain yields, extensive planting of soybean in rotation with corn, early-season irrigation on selected upland fields, and targeted modernization of farm equipment to reduce the 15 percent post-harvest crop loss. 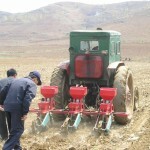 Evaluating a corn seeder pulled by a Chollima tractor. As production began to recover, farms had no incentive to deliver grain to the state at vastly discounted prices. The 2002 price and wage reforms were an unsuccessful attempt to bring official prices in line with the market and thereby stimulate and capture food production. In 2004, farm production quotas were disaggregated to the individual sub-work teams, which were also allowed to sell any grain produced above their quota in the market. Farm managers agreed this had a positive effect on productivity, because workers were then accountable to small family-based work teams, and especially because the family could legally sell rice or corn at a substantial profit. But in 2005, the government attempted to regain control. It required that all grains be sold only to the state at the official price, effectively removing the incentive. The decree was only partly effective. Grain is still sold in the markets, and farmers are focusing their efforts on producing other crops or livestock that can be sold without stringent price controls. A dual economy has been created, not as much between the state and the free market, as between food grains and other produce. So long as cereal grains are subject to special price and market controls that put them at a disadvantage to all other farm products, farmers will be unwilling to invest extra effort in producing these crops. The ability to invest in productive capacity is another critical issue. By the mid 1990s, machinery on North Korean farms was antiquated, spare parts and adequate fuel unavailable, and fertilizer and improved seeds extremely limited. Inputs were available only from the state, and farms had no means of obtaining additional supplies for production, even on loan against a future harvest. This vicious circle drove production down. When aid programs did supply additional fertilizer or new seed varieties, the Public Distribution System (PDS) absorbed the increased production. Farms received credit for their grain in won, but had no way to use the improved income to acquire further production supplies. New farm equipment supplied by aid agencies was similarly affected. Most donated machinery was imported, and farms had no means to purchase spare parts for maintenance. Thus most new equipment soon fell into disrepair. Any profit from increased production was received in won, and furthermore there were no channels for importing spare parts, even though there were black-market mechanisms to exchange won for Chinese RMB. Thus reinvestment in farms’ production capital was stalemated from the beginning. 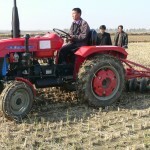 Many of the agencies working in Pyongyang agreed that acquisition and maintenance of modern farm equipment was a central issue. The role of private production must also be considered. Rural household gardens (100 square meters per household) are intensely cultivated and may contribute up to a million tons of food annually, though most is vegetables and fruit rather than staple grains. Much of this production makes its way to the markets, as do small livestock such as chickens, rabbits and pigs raised at the household level. Livestock populations collapsed during the famine years, but from 2001, the government successfully encouraged raising grass-eating animals such as rabbits and goats. Two IFAD-supported projects had a micro-credit component for individual households. The loans were mostly used to purchase small animals and feed. In the project farms, livestock populations grew rapidly, income of participating households increased greatly, and all loans were repaid. The meat, milk and eggs produced were sold through farmers’ markets. The same model, absent the micro-loans, is now seen at other farms as well. For example, a farm livestock work team may manage a piggery that produces piglets which are distributed to farm households, with care and feeding up to the household. Such enterprises are successful because they are based on traditional methods of animal raising and only require inputs which are locally available, and purchasable in won. Restrictions on currency exchange or import of equipment and supplies do not impede production and reinvestment. Prices are also unregulated, thus profits can be reinvested to buy more baby animals and feed. Despite the poor performance of North Korean agriculture, changes in the last decade clearly indicate that the country could feed itself under the right conditions. Farm managers and workers are appropriately cautious but willing to innovate, and given adequate resources could farm more productively. The agriculture research system is engaged in developing earlier maturing crop varieties that make efficient use of soil nutrients. The information extension system has demonstrated the capability to introduce new methods or materials widely and quickly. Aid agencies are united in their emphasis on sustainable farming methods, rational land use, and efficient use of limited inputs. Despite the continuing political concerns that limit funding for development programs in the North, nearly all agencies working in the agriculture sector either explicitly or implicitly maintain a development approach in their activities. Thus while improved farming methods are essential, the main impediments to agricultural modernization are now institutional. They are not related to collectivization or a national uniform agriculture policy per se, but rather to the artificial distinction between grain and other crops, and the inability of farms to invest in productive equipment and consumable supplies. A rational relationship between the prices farms receive of all types of produce and the cost of inputs is urgently needed. Such a price policy would provide farms with the funds they need for capital investment in tractors, plows, seeders, threshers, pumps, and light trucks to jump-start farm production. Needed fuel and fertilizer, powdered lime, green manure seed, and clear plastic film could also be purchased from farm receipts. Small tractor and disk plow speeds field preparation. But a system of acquiring and distributing farm equipment and inputs according to demand is also needed if farms are to have an outlet for profits from increased production. These items may eventually be domestically produced, but initially would largely be imported until the DPRK industrial sector is modernized. Two conditions are essential for agricultural reform to take hold: a single system of prices and import systems to support production resources and reinvestment by farms. Absent these conditions, additional external investment or aid will never be sustainable. This would not prevent the government from regulating prices in order to extract some agricultural surplus to support the urban population or industrial rehabilitation, but the extreme disparity between state controlled grain trade and marketized trade of all other products can only distort farm management choices against increased grain productivity. Making such changes, coupled with the ongoing technical improvement of farm methods, would go a long way toward revitalizing the North Korean agricultural sector and approaching food security. These policy decisions would also have significant implications on the economy as a whole, at first possibly raising urban food costs and reducing the government’s control over the DPRK economy. But in the longer-term, if production rises, the real price of food may decrease, and the government may be better able to manage the agricultural economy. While making these decisions will not be easy for North Korea, they must be addressed. [i] Randall Ireson, “Food Security in North Korea: Designing Realistic Possibilities,” Stanford University: Shorenstein Asia Pacific Research Center, 2006. http://iis-db.stanford.edu/evnts/4140/Ireson_FoodSecurity_ 2006.pdf. [ii] See for example “DPRK Price Data,” North Korean Economy Watch, May 8, 2009. http://www.nkeconwatch.com/nk-uploads/prices-5-8-09.jpg. The official price for milled rice at this time was 44 W/kg. [iii] See for example: Steven Haggard and Marcus Noland, “Reform from Below: Behavioral and Institutional Change in North Korea,” Washington: Peterson Institute for International Economics Working Paper 09-8, Sept. 2009. http://www.petersoninstitute.org/publications/wp/wp09-8.pdf. [iv] “DPRK legal efforts to strengthen planned economy follow currency reforms,” Institute for Far Eastern Studies, NK Brief No. 10-04-05-1, Apr 5, 2010. http://www.nkeconwatch.com/category/organizaitons/institute-for-far-eastern-studies/. Recommended citation: Ireson, Randall, “Why North Korea Could Feed Itself,” 38 North, Washington, D.C.: U.S.-Korea Institute at SAIS, Johns Hopkins University, May 1, 2010. Online at: www.38north.org/?p=533.